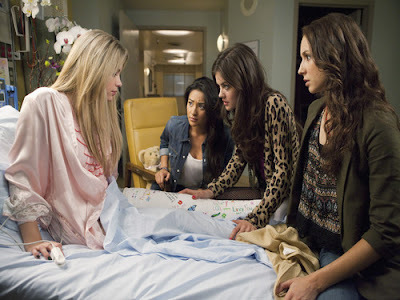 After what seems like FOREVER, ABC Family's Pretty Little Liars finally returned for it's winter premiere last night. I have shared in a previous post how this show is so incredible because its not only has an addicting story line but the fashion worn by the characters is to die for! With the looks of it so far, this season is going to be NO different. Aria, Hannah, Spencer, and Emily returned after Hannah was hit by a car in last season's finale by the mysterious "A" who has been sending them text messages claiming to be watching there every move! Here are some pictures from last night's incredible premiere! Thank goodness Hannah is still alive after being hit by a car in the summer finale. Does Ali finally show up and isn't just in flashbacks?